Allow your taste buds to take full advantage of our passion for dessert. What better way than to finish your day with a warm, fresh, crisp churro. Learn how to get started with your own franchise today with Churroholic. We provide all of the tools necessary for you to get started and to be successful. At Churroholic we take great pride in providing the freshest churro you will find in town. Batches are made throughout the day to provide you with a warm and crisp churro every time you take a bite. 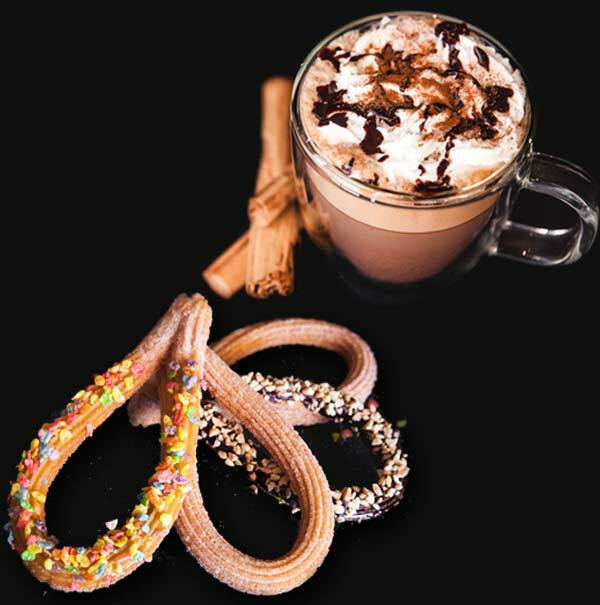 Our flavored coffee drinks are made to perfection and are the perfect treat to have in addition with your churro. Try one of our flavored coffee drinks when you come in, your taste buds will be glad you did. Have you thought about opening your own business? If so Churroholic provides a great opportunity and take all the guess work out of building your own business from scratch. See how we can help you. Churroholic® is a Spanish inspired dessert line created by parent company, Hiccups. An Asian-fusion restaurant with an array of boba drinks, allows our guests the convenience of having delicious pan-Asian dishes with our specialty churros in one location. Our churro artisans undergo rigorous training to ensure that the product our guests receive is of high quality. Founded in Anaheim, CA in 2017, our online reviews and news by word of mouth quickly spread. Since then, Churroholic® has been dedicated to the success and well being of both our guests and staff members. To help ensure our guests receive the best experience possible we have embedded Culture and Unity into our company’s foundation of policies and procedures. In order for us to achieve continuous growth and success in our workplace, management and staff have worked together to be able to create a fun environment in which your friends, family & new acquaintances can gather around for a great communal experience. We want the opportunity to put a smile on your face, and delight your palate. It will be our privilege to serve you!